The New Age movement rose in the 1970s and has largely faded, but its impact remains, according to Mark Satin, whose 1976 book, New Age Politics, has been rereleased and updated in a 40th anniversary edition. New Age Politics: Our Only Real Alternative crosses over between politics and spirituality because of Satin's conviction that the best political change is inspired by a transformed consciousness. Although my views are strictly secular and Satin's are not entirely so, I've found him to be one of the most intriguing thinkers of our era. The questions I asked focused more on the spiritual than political. The interview was conducted over email. Rick: Over the past 40 years, how has "New Age" spirituality evolved? When I came upon the scene in California in the 1980s, there was a lot of "new religions" or cults, to use a pejorative term. It seems like these have faded, and Buddhism now fills the niche for people seeking an alternative religion. How do you see this? Mark: New Age spirituality has gone mainstream! I mean, hardly anyone uses the term "New Age" anymore, but I suspect most Americans now have a personal interpretation of God. It may be informed by the Bible, by what we hear at church, and so on, but it's also informed by our own life experiences, by revelations we may have had, by our encounters with other faiths and with healers and teachers whose faiths may not be easily classifiable. And that was the essence of New Age spirituality, was it not - to take responsibility for our own pathway to the divine? The religious writer Thomas Moore captures the spirit of what I'm saying in the title of one of his recent books, A Religion of One's Own: A Guide to Creating a Personal Spirituality in a Secular World. You might think American Buddhism represents a return to a more conventional spirituality. But talk to American Buddhists and you'll find an amazing variety of views on spiritual and secular topics - a variety, I dare to say, that's shaped more by their life experiences than by their sect's teachings. All of what I call in New Age Politics our "monolithic institutions" are being stripped away today, thank God, and that includes the strictures of all the world's religions. As a result, we are becoming closer to God than ever before. Do you see? Without dominant mediating institutions, our relationship to God is more personal than it's ever been, and we are more vulnerable and naked before God. Hopefully that will help us make more inspired political choices. 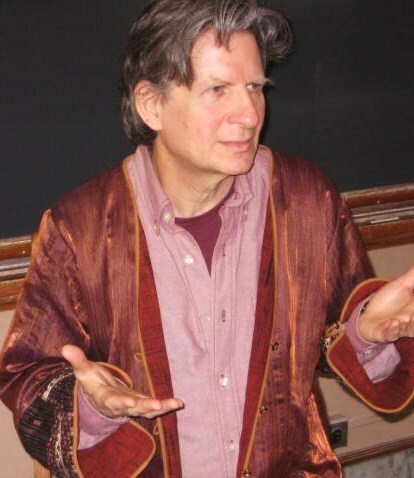 Rick: In The Yogi and the Commissar, Arthur Koestler wrote about a spectrum of those seeking change, from the more psychological to the more materialist perspective. It seems like your New Age Politics was an appeal to look more toward the Yogi. Is that so? Mark: I haven't read Koestler for nearly 50 years - I loved him, he helped me avoid the worst excesses of the radicals of the 1960s. (Barely.) But if I understand your question correctly, then I'm going to have to answer with a qualified "Not really." It is true that my book stands Marx on his head, says our social and economic problems are ultimately traceable not to capitalism but to the consciousness most of us share. A consciousness that goes back hundreds if not thousands of years before capitalism! Thus far I guess I resemble the Yogi. But unlike many spiritual people, I define that consciousness very precisely. I say it consists of a complex of six cultural values or attitudes that I like to call the "Six-Sided Prison." The six walls of the Prison are patriarchal attitudes, egocentricity, scientific single vision, the bureaucratic mentality, xenophobic nationalism, and the "big city outlook." These Prison walls are depressingly familiar to us, are they not? I have spent much of my life trying to bust out of them. They are not only ultimately responsible for racism, militarism, ecocide, ridiculous wealth and opportunity disparities, and all the other horrors of public life. They are also ultimately responsible for the ways we repress our inner selves and those closest to us. But note my use of the word "ultimately." There is a Commissar in me too! For the Prison doesn't exist only in our minds, and we can't just wish or meditate or educate it away. Over the centuries it's generated "monolithic institutions" that repress us from without, and that reinforce and perpetuate the Prison within. Church- and dogma-centered religion, which I touched on in answer to your first question, is one example of a monolithic institution, but there are plenty of others - the automobile-centered transportation system, the jobs economy, the military defense system, doctor-centered healing, lawyer-centered dispute resolution, school-centered credentialing, compulsory heterosexuality, excessively rigid social roles, the hyper-centralized state. On and on. All these institutions are what I call "deep monopolies." They are monopolies not of brands, but of products and processes. They deny us choices in life, and they make the Prison of consciousness feel natural and "right" to us. So I am a Commissar to the extent that I want us to break these monopolies up, by any means short of violence. Not to be too cute about it, then, but New Age Politics could be re-titled "The Yogi and the Commissar Walked Into a Bar ... ." The last section details all the ways we need to work on ourselves, to break the stranglehold that the Prison of consciousness has on us. But it also details a myriad of ways we can work to break up our monolithic institutions. My experience is that, in real life, most people who are drawn to working on the Yogic side are also drawn to working at the Commissariat, and vice versa. And I think that's not an accident. New Age politics is natural to us, once we reject the silly Marxist notion that we should postpone working on ourselves until "after the revolution." I suspect that that's what Koestler really wanted to see, by the way. He would have wanted the Yogi and the Commissar to meet at the bar - at the middle - at what my last book called the "radical middle." He may have felt it was impossible in the 1930s and 1940s, when the Commissars were fascists and communists. But in our time, it is imperative for consciousness change and institutional change to proceed together. One of the theses of New Age Politics is that - for better or worse - you can't have one without the other. Rick: How do you see our current politics in terms of materialist and post-materialist values? It looks to me that the economy's inability to increase material wealth of working class people is causing a lot of anger. I am, however, skeptical, that any policy, even raising taxes on the 1%, will make that much of a difference. I'm inclined to believe that slow grow in the developed world is chiefly due to a slowing of technological change (despite the internet) - as discussed in Robert J. Gordon's new book, The Rise and Fall of American Growth - and that we need to shift to a more post-materialist mindset where we seek to grow in happiness through psychological practices like mindfulness rather than seeking more material goods. Mark: We have simply got to change over to a post-materialistic mindset. That's exactly what I am getting at when I say we have to replace Prison attitudes with life-loving attitudes - patriarchal attitudes with post-patriarchal attitudes, egocentricity with spirituality, and so on down the line. There's even a section in New Age Politics where I propose replacing the materialist worldview with what I call a trans-material worldview. And, of course, I propose replacing each of our monolithic institutions with their "biolithic" equivalents. Production and consumption would stop being the be-all and end-all. Our houses might shrink back to the size they were in the 1950s, but creativity, social service, and the capacity to express and receive love - politically as well as personally - would reign supreme. That world is possible. But Professor Gordon isn't going to bring it about by making logical, economic arguments in favor of it. They're nice to have in our quivers. But such arguments have been there for decades. When I did the research for New Age Politics in the 1970s, there were all sorts of economists and other social scientists - many of them as prestigious as Dr. Gordon - who were making logical, "respectable" arguments in favor of changing over to a post-materialist society. E. J. Mishan, Fred Hirsch, Edward Goldsmith, René Dumont, Tibor Scitiovsky, William R. Catton, Walter A. Weisskopf, Herman Daly, Warren Johnson, Robert Theobald - most of them are forgotten today. Do you see where I'm going with this? Telling us that we "should" do something is a non-starter. The heart will do what it wants to do, not what it must do or "should" do. What political activists need to do is launch a cooperative, evolutionary, transformational movement that will prefigure a post-materialist New Age society (or whatever we want to call it now). We need to make our goals and our everyday processes seem so compelling, so life-affirming, and so sustainable, that people will want to live in that world even if it means they'll have to drive smaller cars and accept that everyone on Earth needs and deserves to be Number One. The entire last section of New Age Politics is devoted to showing what an evolutionary, transformational movement might consist of. One of the wonderful things about living a long life is that I've been able to watch this society move, more rapidly than I could ever have imagined, to dealing with the Prison within and its institutions without. It hasn't been pretty, and there's no organized political movement to frame our activities, so we haven't really known what we've been doing. But I really do think that the blueprint for change I laid out in New Age Politics - a blueprint based on the writings and activism of hundreds of good people who came before me - is being acted out before my eyes. We are laying the foundations for a post-materialist, New Age society, even if we don't yet have a movement to coordinate our efforts, and even if we don't yet have a better name for it than New Age. Rick: Do you meditate? Have you meditated in the past? If so, how have these experiences affected you? Mark: I do mediate, and I've done so for decades. Learning to meditate actually opened me up to the ideas I synthesized in 1976 in New Age Politics. Doing the research was not sufficient to get me there, and at age 27 I'd had almost no life experience (though that wasn't how I saw it then!). Somehow, meditation gave me the depth and discernment I needed to cut through the Marxist and anarchist predilections of my cohort and ask the questions that really needed to be asked. I began doing your standard breath meditation in the early 1970s. I was helped along in part by a men's consciousness-raising group - yeah, I really did participate in a lot of the things I was calling for in New Age Politics. But breath meditation didn't really suit my temperament. By the mid-1970s I'd discovered Vivekananda's writings on Karma Yoga, on making work itself a yogic practice. The sweetest passages in New Age Politics and in my subsequent Washington, D.C.-based political newsletter, New Options, were written "under the influence," so to speak. (The most relevant issues of New Options are now online, just Google "New Options Newsletter - by Mark Satin.") Today I find great sustenance in the writings of Krishnamurti, who urges us to meditate while doing the dishes or walking around. One thing I have noticed over the years is that some of the most dedicated meditators I know are also some of the most aggressive, manipulative, and competitive people I know. My feeling is that these individuals are using meditation as a substitute for psychotherapy, and it can't be used that way. Meditation helped open my mind to the vision and insights in New Age Politics. But Rogerian therapy taught me to forgive my parents, love myself, and be open to and respectful of all others. Even Marxists and anarchists! In other words, meditation made it possible for me to conceptualize and write my book. But therapy made it possible for me to live by its beautiful philosophy ... at least most of the time. As New Age Politics itself might say - you could call it its mantra: We need both!